Shrink film is more of common term used in the retail packaging space but also for protection of goods and load bundling. This films comes in several sizes, density and widths. 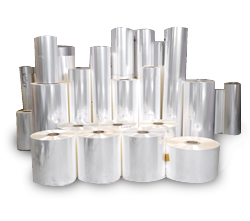 Common film types are the following: Polypropylene, Polyethylene, Polyolefin, and PVC. These films all act in the same way. When they are made, they are stretched in different directions. When they are heated, they try to go back to their original shape by getting smaller. It is this process of getting back to its original shape is what wraps around your product. With so many offerings of Shrink film, we can work with you to define your options for your next packaging project, all while giving you the option of having us hold Inventory for you. Below are some of our offerings and where they are commonly used. Please contact us for just a quick question or to discuss your new project - we are listening!! Click here and we can provide a customized quote for you on this material for your project as well. The most versatile shrink film. User for general purpose retail shrink wrapping. Will shrink at relatively low temperatures, it is strong and seals well. This film can be engineered bi-axially, meaning it will shrink in both directions when heated. It can also be ordered in the single direction (preferential). A key benefit of this film is that it seals and shrinks at lower temperatures than other material while maintaining clarity. Ideal for applications where gloss, clarity, seal strength and film strength is important. This is the thickest of the films. It is stronger, thicker and more resilient than the other shrink films. Sometimes referred to as “industrial shrink film”. It used to bundle products together to form a pallet. Also used to protect items during shipping and loading. This film is very versatile. It is as approved for FDA applications and direct food contact. This film combines the best functions of polypropylene and polyethylene to produce a film that can stretch in all directions with still keeping its very high clarity. This film must be vented and the package must be wrapped on all sides.